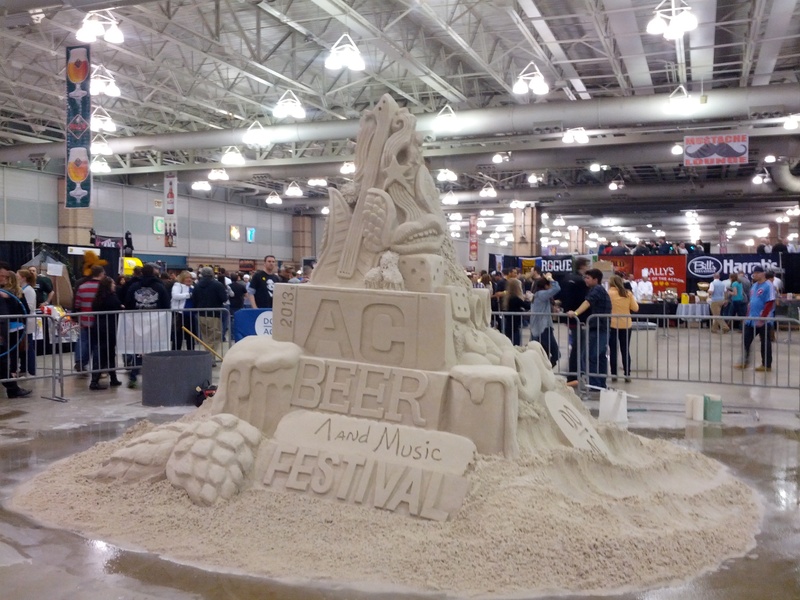 The official AC Beerfest 2013 sand castle. Another Atlantic City Beerfest is in the books, with this year bringing even more drunkenness than last year – myself included. I guess that’s what’ll happen when they’re pouring beer as good and heavy as Dogfish Head 120 Minute at event, but I’m not making excuses here. I did manage to get to most of my must-haves before it got too late into the festival and caught some of Rusted Root’s performance, so I consider the night a success overall. This year the plan to get there a bit early worked to perfection. We arrived in time to be scanned in before the crowd and witness the start of the event. This involved a man in a moustache suit and kilted bagpipe players leading the crowd through the convention center, which really got the atmosphere charged. There was a tangible energy going through the crowd that really added to the experience, and got everyone pumped for what was to come. DAS enjoying a taste of Framboise Lambic. Once they let people in, I got my group to head straight for the back for shorter lines. See, when the gates first open, people get distracted by the first booth they see, wanting to just get their first beer. Lines tend to jam up at the front booths at the very start of the beerfest, so I head to the back to avoid the traffic until the crowd is more evenly dispersed. This gave me a great chance to grab some top notch beers like Terrapin Hopsecutioner, Stone Cali Belgique and Mission Shipwrecked. All three were awesome, awesome beers. Hopsecutioner and Shipwrecked were pure IPA’s with crisp bitterness and heavy duty hop kicks, but the Cali Belgique was a hybrid Belgian IPA. It was a really interesting beer – hoppy with the nice touch of the yeast ester characters of a Belgian. Cali Belgique really makes me want to toss some Belgian yeast into my next Franklin IPA just to see what happens. New Holland pouring their awesome Dragons Milk stout. From there we did some wandering, hitting up old favorites like Smuttynose for their Old Brown Dog and Lagunitas for their awesome IPA. 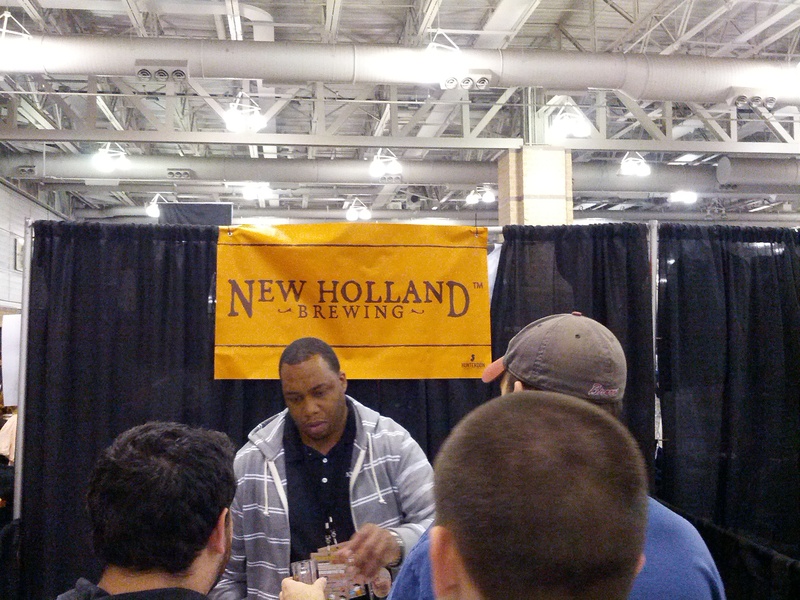 New Holland was there pouring Dragon’s Milk stout, which I was really excited to try. I got a bomber of this in a trade a couple months ago and haven’t opened it yet, so getting to try it while preserving my bottle was great. It’s a bourbon aged stout, and the beer is more than heavy enough to balance out the burn of the bourbon. Really smooth, great body, and I can’t wait to open up my own. I’m trying to be patient with it and see where it goes with age, but trying it at the beerfest makes me want to crack it sooner rather than later. As for the breweries I mentioned in my preview post, I did get to stop by most of them. Giving 21st Amendment another shot was a great idea, as I really enjoyed the Back in Black and especially enjoyed the Brew Free or Die. Even the Hell or High Watermelon was improved, though I’m still not sure I’d buy it again. Since 21st Amendment comes in cans, I’ll definitely be adding them to my summer rotation. Firestone Walker was its usual phenomenal self, with the Double Jack and Wookey Jack starring this year. Founder’s had some really go people (and beer) at their booth, I had a good talk with their reps about Kentucky Breakfast Stout. Turns out even they’ve given up on getting ahold of KBS, which just makes me want it more. I gotta find that next year! I did finally get to try some mead, from Moonlight Meadery. It was much sweeter than I imagined, and not as dry. My patience will definitely be tested waiting for mine to mature. Unfortunately, I wasn’t able to make it to Ballast Point, as the line there when I first came around was entirely too long and I never made it back there with all the awesome beer that was offered throughout the festival. I did, however, manage to find some Victory at Sea a few days later, so I’ve got that stashed away for a rainy day. The New Jersey breweries were all put into one area, which made it really easy to try them all and compare how the Garden State is doing. The newbie Bolero Snort impressed, I really enjoyed their flagship Blackhorn lager. It’s a hopped up lager that went down smooth with enough of a bitter kick to satisfy hopheads. Kane was again on point, their Head High continues to be one of my favorite IPAs. 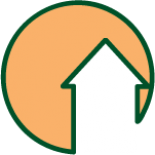 I got to try Overhead, their imperial IPA, for the first time, and it was a great step up from Head High. Super fruity aroma, nice body, and a crisp bitter finish made this one drink easier than it’s intimidating BJCP category would allude to. Turtle Stone, out of Vineland, NJ, brought a different set of beers this year, and I really enjoyed their stout. It had an earthy quality to it, and tasted the same as it would if you just chewed the grain it was made from. That may not appeal to everyone, but I throughly enjoyed it, and came back for more by the end of the night. You can’t help but be excited for the progress the New Jersey craft beer scene has made. Rusted Root entertaining the crowd. 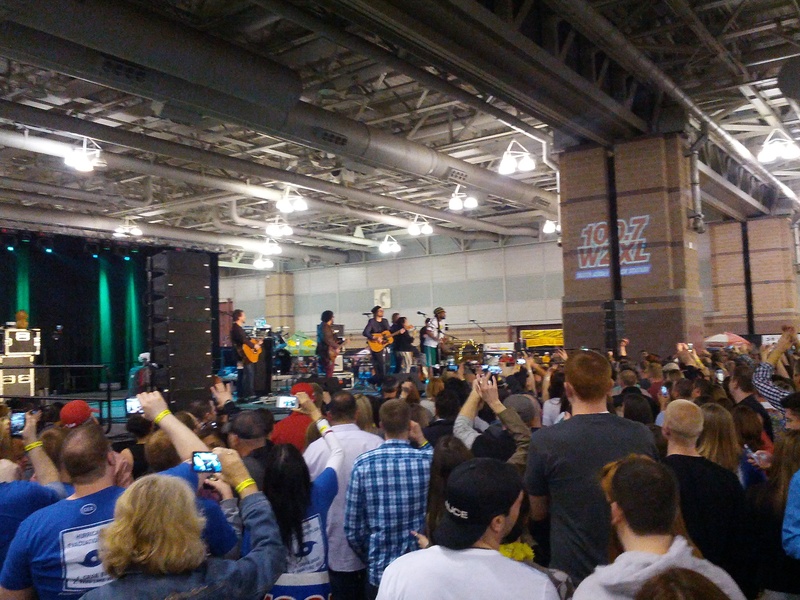 AC Beerfest is well worth the cost every time, even if it’s just for a good night out with your buddies. I learned the hard way this year that snagging two tasting cups is not the best way to go, but it was a damn good time that way, and I did get to try twice as much beer as I normally would have. I won’t be repeating that act next year, but it was fun for one go round. 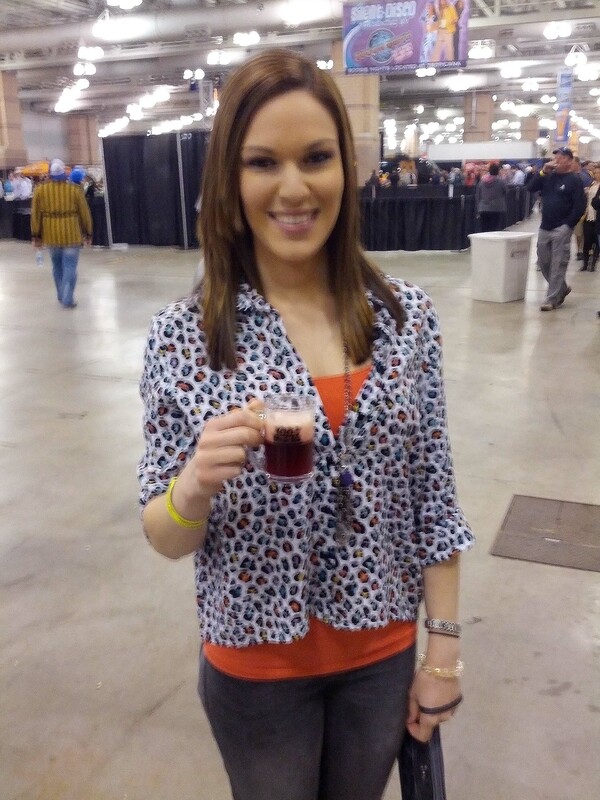 If you haven’t been to the Atlantic City Beerfest, I recommend giving it a shot, at least for one year. Sure, it’s crowded (especially the last Saturday session), but the atmosphere there is awesome and the beer is always good. What’s your favorite craft beer event? 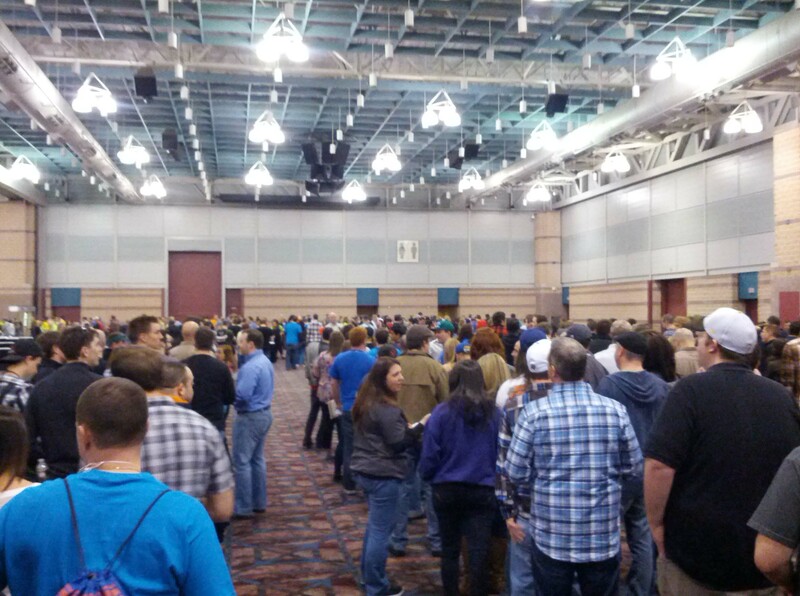 This entry was posted on April 17, 2013 by dasalehaus in Brew Review and tagged 21st amendment, ac beerfest, Atlantic city, beer review, beerfest, cali belgique, kane brewing, new holland, stone brewing, turtle stone.